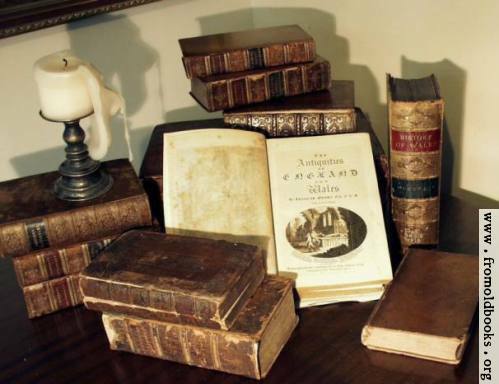 Bring the Books: Christian Thoughts on Penn Jillette's Book God, No! Christian Thoughts on Penn Jillette's Book God, No! 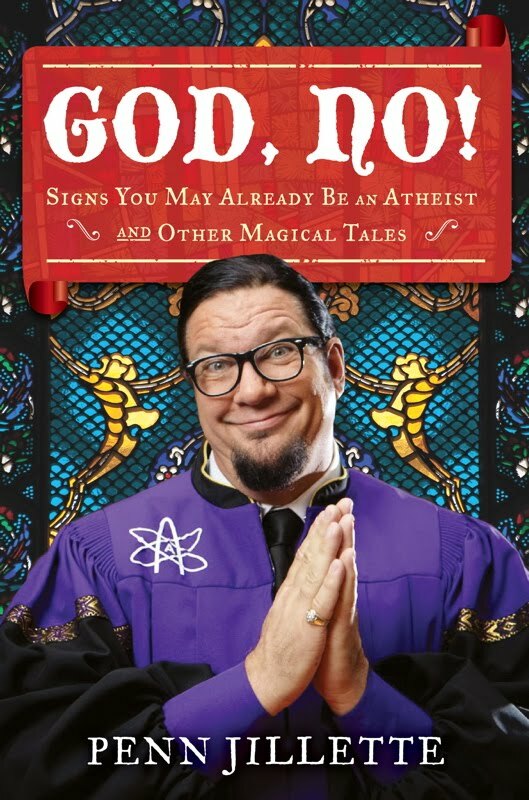 I'm trying to figure out how to talk about Penn Jillette's new book God, No!. After all, this is a Christian blog, and lets face it - Penn Jillette has a propensity towards colorful language. You don't, for the most part, quote him in mixed company. Couple that with the fact that he is a self-described hard-core atheist (he doesn't even believe that other people believe in God) and you might wonder why I'm talking about his new book. The fact is, I like Penn Jillette. I am what he would describe as a totally insane, wacky Christian fundamentalist, and yet here I am reading his new book. It's because I like him. 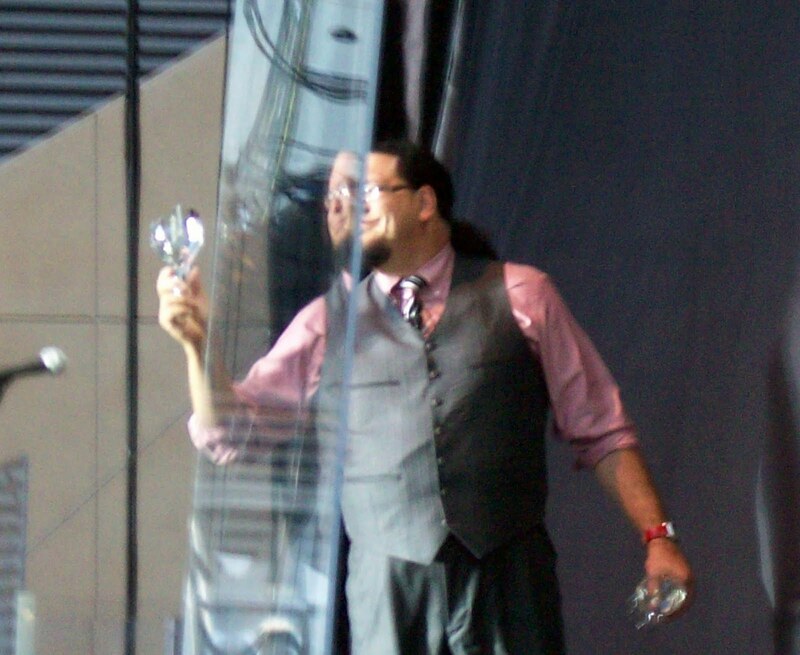 I think I see Penn Jillette as my non-Christian doppleganger. I mean, the man is a big, loud, opinionated, awkwardly shaped Libertarian, and he loves truth. We are more alike than we are different, in my opinion. And so I've felt an odd kinship from a distance with the man for - oh, the last ten years or so, I guess. 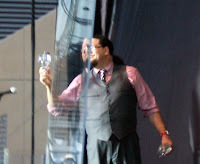 Last year I was in Las Vegas for a convention related to my job and as I walked around Vegas I hoped to myself that I might catch a glimpse of Penn Jillette. And you know what? Our convention put on a Brian Setzer orchestra concert and it just so happened that Penn Jillette was there, for free, juggling broken wine glasses and doing a pretty funny schtick all the while. It was such a thrill to see him in person. I even took a picture (left). If I could have found a way to do it and not seem like a stalker, I would have gone up to him and shaken his hand and told him I was a huge fan. But... it didn't happen. I wouldn't have known where to find him after the Brian Setzer show anyway. So why? Why read it? Well, I was interested in the book for its atheism content, mostly. If the book was really just a bunch of dirty stories, I probably would have passed. The fact is, I really think Penn has some things to teach Christians. And even if Christians don't appreciate what he has to say, it's important that we read atheists so that we know who we're talking about. Also, I like to laugh, and I knew Penn would deliver. I know it would bother him to no end that Christians might just read his book and mine it for quotes to "rally the masses" as it were (that may be why he included so much profanity - so we'd be scared to quote it), but that's exactly what I plan to do. See, the fact is, Jillette is a pretty honest guy and he calls things the way he sees them, and in truth, he seems to "get" evangelism. We actually posted a video from Penn Jillette about three years ago. In the book he discusses his annoyance that fundamentalist Christian churches, organizations, and blogs used this same video to drum up evangelism efforts and mobilize the masses. He says nobody asked his permission to use the video except for Campus Crusade for Christ. Anyway, the video has now been made unwatchable on Youtube, but he basically shares the same message from the video in the book. He says that proselytizing is a moral thing and that whatever your view of things is, you must share it if it is true. If our Charlie really believed that there was everlasting life through Jesus Christ, piggies, or L. Ron Hubbard, how can he not proselytize? How can it be moral to be politely quiet about something that important? If our life here is really just a brief vale of tears and the real joy is after we croak off the mortal coil, if someone really truly believes all that like ice like fire, don’t they have to preach to everyone all the time? Atheists are also morally obligated to tell the truth as we see it. We should preach and proselytize too. We need to help believers. Someone who believes in god is wasting big parts of his or her life, holding back science and love, and giving “moral” support to dangerous extremists. If you believe something, you must share it; it’s one of the ways we all learn about truth. I should pause to say, this book fits right alongside the other books in the corpus of works by the New Atheists (Hitchens, Dawkins, et al) where there is more ad hominem and name calling than actual logic in defense of atheism going on here. I think this may, in part, be the nature of this book. The book is so rife with foul language and sexual content that Jillette almost certainly believe this book is preaching to the choir, because only the choir would read it. After all, why would some crazy fundie actually read this book? Anyway, there are not many arguments, if any, against Christianity. Jillette knows that Christianity is a superstitious, silly, baseless religion, and because of that, he is logically free to speak as he wants and tell the lewdest stories he can manage. For that fact alone, there is little to critique, since you can't critique name-calling. Needless to say, this book is not a serious apologetic for atheism. It is, for Jillette, a celebration of the freedom and meaning which he sees in his worldview. The book is really just a series of vignettes which are not connected to one another. Jillette writes about growing up in a Christian home and being asked by the pastor to stop attending youth group because he was turning the kids into atheists. He ruminates on what it is to be in a business partnership with Teller. He discusses his rivalry with The Amazing Kreskin. He talks about Sigfried and Roy and what a classy pair of magicians they were even though he mocked them publicly whenever he had the chance. He talks quite a bit about his Libertarian political views and spends a great deal of time ripping on the TSA, which I quite enjoyed. He has an interesting and hilarious anecdote about encountering the 'masked magician' who supposedly ruined tricks for magicians everywhere with his specials on FOX (it didn't even phase Penn). Most interestingly, he discusses magicians and their philosophy of magic. He despises performers like Kreskin, David Blaine, and Criss Angel who try to convince people that they have some sort of 'other worldly' powers behind their acts. He does connect this to Christians who cheapen their message by turning even the Gospel into a silly hat-trick. It’s always astonished me how any magician can be spiritual. There are hippie magicians who do drum circles in the woods and then do a card force and a false shuffle and think they’re expressing something real. “Imagine a universe so limitless and yet so all-connected that you chose the three of clubs!” There are even “gospel magicians” who’ll do a cheesy “cake in the hat” trick and tie it to the resurrection of zombie Christ: “And god so loved the world that he gave his only son our lord and savior to die for our sins and give us this chocolate cupcake out of your baseball hat!” It seems like depicting the most important event in one’s philosophy with a $19.95 trick from a joke shop cheapens it a bit. Again, I guess I agree completely. Jillette also falls right into line with the New Atheists when it comes to defining atheism. It used to be that atheists believed that God doesn't exist, but now it is very, very common to hear atheists define themselves more along the lines of what we think of as agnosticism. “Agnostic” is often peddled as the gentler, more measured version of atheist, but I can’t see it that way. It doesn’t fool anyone. When someone hedges, we all know what he or she means. Most “agnostics” are really just cowardly and manipulative atheists. Religious people aren’t as stupid as “agnostics” think (no one could be). Believers can smell a godless loser who doesn’t even have the guts to answer a question from half the length of purgatory away. An outright lie shows more respect than a dodge. If you’re going to lie, get down on your knees, pretend to praise god, and rot the faith from the inside like the worm that you are. I saw a recent poll that said 1 in 6 pastors in Dutch churches is an atheist, so it sounds like some people have the same idea as Penn. There is a laugh-out-loud moment near the end of the book that I really enjoyed. Penn is talking about how he and Teller will discuss pretty much anything on their Showtime series, regardless of who they offend. However, they do have their limits. But we’re careful with Muslims. Again: Christopher Hitchens said, “There are no atheist martyrs.” That’s good thinking. If Penn & Teller were ever going to seriously punk a religion, we’d pick the Amish. F*** them all and the nonviolent horse and buggy they rode in on. One point which I hope Penn's readers will not miss is that Jillette appears to believe emphatically in an objective morality. This is perhaps the weakest aspect of Jillette's worldview because it would be impossible, I think, given his trenchant moral condemnations of evil in the world (much like Hitchens' God is Not Good) for Jillette to retreat into relativism if pressed. And yet the atheistic worldview cannot account for universal, invariant, and nonphysical moral laws. My guess is that Jillette would answer that there is nothing wrong with answering "I don't know" to such a challenge. In the end, this review of Penn's new book was pretty sporadic, because the book itself is sporadic. I don't recommend it to anybody, simply in terms of its language and sexual content. There is good and funny stuff in this book, don't get me wrong, but you have to wade through an awful lot of things that almost any God-fearing believer wouldn't touch with a ten foot pole. The truth is, I need to go detox after reading this. It's going to be the Apostle Paul and Walker Percy for me.